Why would you call a building that hosts more than 165 working professional artists the Torpedo Factory Art Center? Because from November 12, 1918 until June 1945 workers in the building manufactured, maintained, designed, and tested torpedoes for the USA! 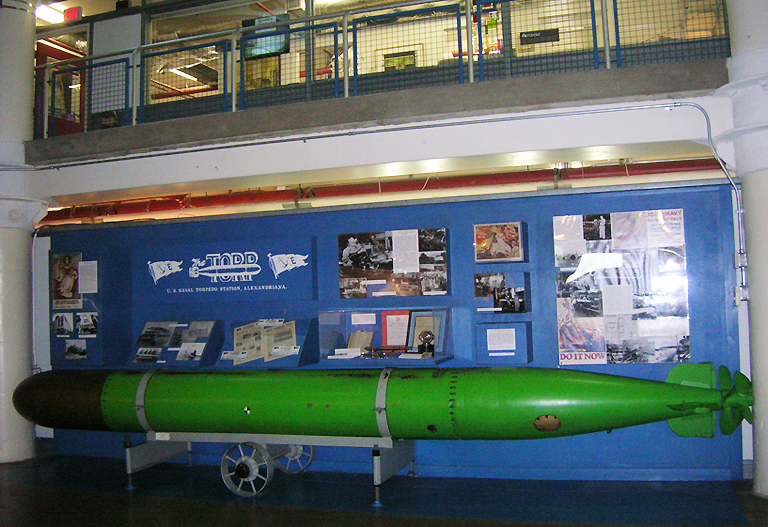 The photo shows the Mark XIV torpedo made here in 1945. It was painted bright green so that the Navy could find it in the water when it was tested. In 1969, Alexandria, VA city officials bought the building from the federal government. Five years later, after many hours of hard work renovation and clean-up by artist volunteers and city personnel, the Torpedo Factory opened to the public. Many more renovations continued to improve the building for artists who have studios there. More than one million visitors a year see artists designing and creating beautiful works. You can also shop in the studios. I've bought yarns, jewelry in various media, and ceramics. This is a Lori Katz teapot we bought in the Torpedo Factory. We met Lori and enjoyed learning about her process. We have a second cup and saucer colored opposite of the one in the photo. The set makes a beautiful center piece setting for the dinette table when it’s not brewing our favorite tea. Our daughter calls it our Alice in Wonderland teapot set!